Whether you're moving across town or the across the state, Meathead Movers has local, student-athlete Tulare movers, ready to get you safely settled into your new home. Your moving t0-do list might seem unending, but our Tulare movers are here to give you peace of mind. From getting packed to making travel arrangements, you have plenty on your plate as it is. When you are ready to simplify your moving process, it is time to give Meathead Movers a call. Tulare is best known for Tulare Lake, which served as a gathering point for people even before California was settled by Europeans. In fact, Tulare Lake was once the largest freshwater lake on the west side of the country. Unfortunately, droughts and other factors have left the lake dry, but Tulare has continued to be an appealing destination. With a population just shy of 60,000, and major agricultural industries located within the city, it is no wonder that people are considering moving to Tulare. The city hosts the World Ag Expo, which is an agricultural gathering that attracts 1,600+ exhibitors each year. Many people visit Tulare on their way to Sequoia National Park, which has an entrance just 45 minutes away. If you are considering a move to or from the area, our Tulare movers are well equipped to handle the job. 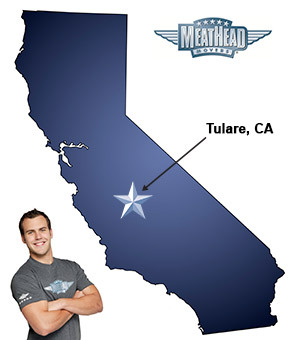 Meathead Movers specializes in local, long-distance, and commercial moves to, within, and from Tulare. We also provide reliable packing, storage, on-site relocations, and our distinctive moving concierge service. All our student-athlete movers are thoroughly screened and trained before their first move. Every one of our Tulare movers is committed to working hard on the job. To prove this, each employee will speed up the moving process by jogging when they are not carrying any boxes. That’s the Meathead Difference. No matter what moving services you may need, Meathead Movers can get the job done. With our 100% satisfaction guarantee, the only thing you have to lose is the stress that comes from moving! So contact us today for a free moving quote and to learn how our Tulare movers can help you on your next move! Moving to Tulare? Here are some helpful resources. First and foremost, the 4 guys in what we thought was too small of a truck took almost 12 hours to move us 20 minutes away, which was AMAZING because we didn't even have them move EVERYTHING. We had rented a uhaul truck to move smaller items the day before the big move. Also, we have noticed more and more scratches on a lot of our furniture including our dryer. I would hesitate to recommend Meathead Movers to anyone we know. Very quick and hard working crew! Very happy with how they handled the move. Very professional & excellent service from the gentlemen who assisted us with the moving. I liked supporting students and the colleges I attended. They were very friendly, professional, and careful.